In the bowl of a stand mixer, using the dough hook on medium speed, mix together 1/2 cup warm milk, 1 teaspoon granulated sugar and yeast until combined; allow to sit for 10 minutes or until bubbles form. Add 3 tablespoons melted butter, additional 1/2 cup milk, 1/2 cup sugar, 2 eggs, 3 tablespoons maple syrup, 1 teaspoon salt and vanilla to yeast mixture and mix until well combined. Mix in bread flour and white whole wheat flour until combined; continue to mix for an additional 5 minutes or until dough is smooth and elastic. Form into a ball and place in a large mixing bowl lightly covered with cooking spray; cover with plastic wrap and allow to rise in a warm area for 2 hours or until doubled in bulk. To make the Maple Blueberry Granola, in a medium bowl, whisk together 1 tablespoon melted butter, additional 1 tablespoon maple syrup, additional 1/4 teaspoon salt, brown sugar and cinnamon until well combined. Stir in pecans, coconut and oats until combined. Evenly spread oat mixture onto cookie sheet. Bake 15 minutes, stirring occasionally, until granola is fragrant and golden brown. Transfer to a medium bowl and stir in blueberries until combined. On a lightly floured surface, using a rolling pin, roll dough into an 11x15 inch rectangle. Brush dough with remaining 1 tablespoon melted butter. Evenly sprinkle granola on top, leaving a 1/2 inch border. Starting at one end, roll dough up jelly roll style, pinch and tuck ends under, and place in loaf pan. Lightly cover with plastic wrap and allow dough to rise 1 hour, in a warm area, until doubled in bulk. Whisk remaining 1 egg together with a tablespoon of water; evenly brush on surface of dough. Bake 20 minutes, cover with foil, and bake an additional 35-40 minutes or until internal temperature of bread reaches 180 degrees F. Cool pan on a wire rack for 20 minutes before removing bread to a wire rack to cool completely. 29 comments on "Maple Blueberry Granola Bread"
It looks huge, but it looks so good that you're probably happy it's that big! hope you had fun decorating those cupcakes!! haha. The bread looks so fluffy and amazing. What a great way to warm up on a cruddy day! Your weather sounds a lot like NY weather! Just as soon as we see a nice day we think spring has arrived, only to have a chilly, rainy day the next day. We will go from 40 to 80, but the 80s don't start till May. :-( Send some bread my way to cheer me up. That bread looks very brioche-like! It's beautiful! I love the idea of maple and blueberry together. Wow that does seem like a huge loaf of bread! But I say the more the merrier. Maybe if you eat the whole loaf before the wedding, your metabolism will be so high that you'll feel warmer? Hmm. Oh my gosh. I bet this would make INCREDIBLE french toast. Love the idea! P.S. I agree that dried blueberries are awesome! Love your bread! And the swirl in the middle, perfect for breakfast! Does the granola in the filling stay crunchy, or does it soften due to baking in the bread? Wow...I like this idea a lot. This would just be great for a snack any time of the day! This looks heavenly! I would love a hot slice with a wee bit of butter. Mmm, I can eat bread no matter what the temperature - this looks delicious! The weather is the same way in NY in the spring - hot, cold, rain, snow. Blah!! Wow! That bread looks awesome! pretty much every time i read your posts, i say "oh my god" twice. one for "holy crap this looks awesome." and one for "geez, i really need to get to the grocery store again for these ingredients." BUT THANK YOU! keep up the awesome work. I am so intimidated by yeast breads. This looks delicious though! I'm a sucker for anything with blueberries in it. Shannon, I thought it stayed fairly crunchy. I don't ever really remember it getting that soggy. P.S. to everyone, I am very behind on my blog reading. I'm sorry. I plan on catching up soon. Emily, that is a GORGEOUS loaf of bread! My homemade loaves never rise enough... probably because I use too much whole wheat flour ;). Adding granola to yeasted bread is an awesome idea, and I can only imagine how delicious this is. I can also only imagine what is going on those bachelorette cupcakes! incorporating granola into the bread is a really brilliant idea, and one i plan to put to use immediately! Seriously??? We're supposed to have snow this weekend??? That's crap! I can't wait to get out of Missouri! Next week baby! At least you are near civilization instead of in the Middle of Nowhere...you know...Ft. Lost in the Woods. This bread looks absolutely amazing! I absolutely love the swirl in the center. How fun...a little butter and I'm all in baby! The granola swirl is awesome! Your creativity always inspires me! 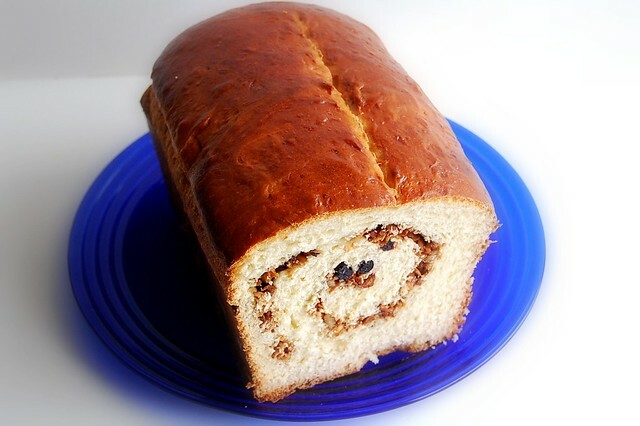 I want a slice or two of this for breakfast (maybe with a cinnamon compound butter). Oh now - snow in April! Sounds like Saskatchewan! 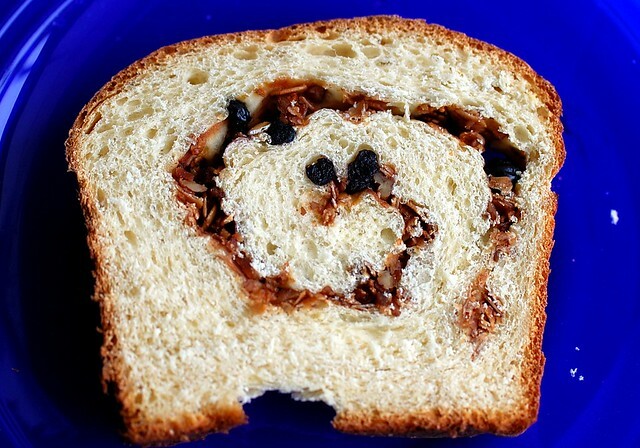 I had never seen a granola swirl in bread before--great idea! Love this bread. Looks so good and full of flavor! Perfect for my house- we are carb-o-holics! 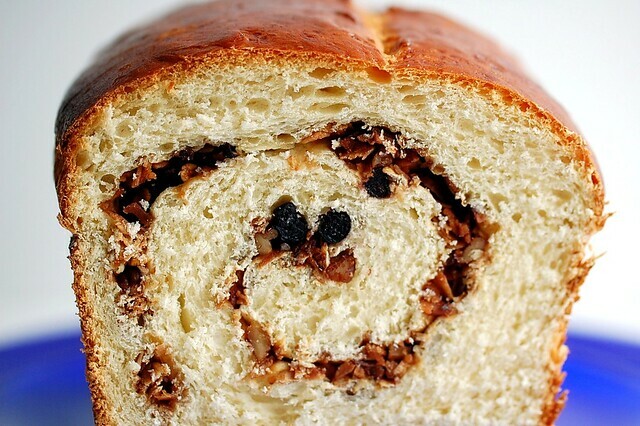 Bread with a swirl in the middle always looks so fun. The maple blueberry combination sounds delicious! 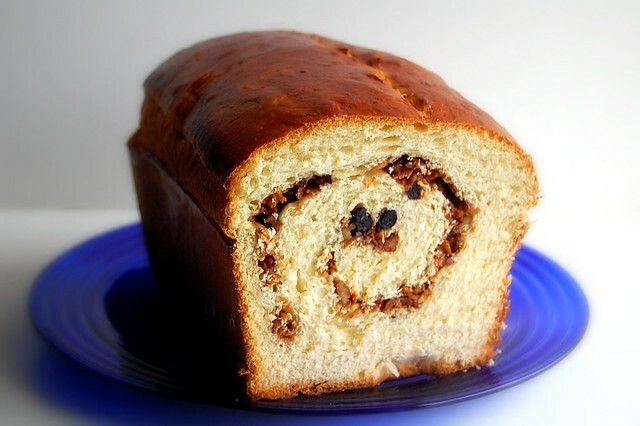 A granola swirl in bread is just genius - love it!